It is not often that I get on my high horse, but today is one of those days. I do believe that some divers forget the importance of their regulators and the job they have to do. These are life support equipment, designed to keep the diver alive in a very harsh environment. 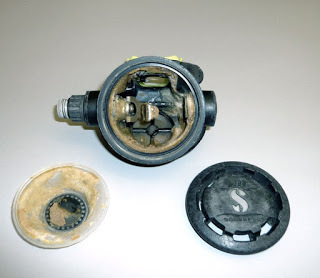 We here at the Go Dive Brisbane service department often see regulators that are not in the best state of repair. Some filled with salt crystals others with ants nests, even cockroach nests and silicon diaphragms partially eaten. Here are some very easy tips for keeping your Regulators in tip top shape between dives. Let regs dry and then store and transport in a regulator bag. (This protects the regulators again from mould, bacteria and keeping in a reg bag helps keep insects from infiltrating the regulators and making a home. This isn't just limited to Regulators, but all of our dive equipment. BCD's require just as much attention. The dangers are all too real for those that have had dive equipment failures during a dive. So at the end of your next day, take the time to care for your dive gear, your life might depend on it!